Baby Woodrose - "Money For Soul"
Well the new Baby Woodrose CD has arrived and for those who can’t get enough of that 60’s psychedelic thing then this will be a must! 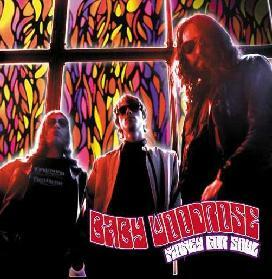 Baby Woodrose, hit the scene in 2001 and since has released a full length CD/LP (Blows Your Mind), multiple singles, and soon a live LP (from Gutter Island Festival August 2002). Guf, the leader of the band and also the drummer in On Trial, has largerly done Baby Woodrose on his own but this CD has the full band playing. The tracks are deeply rooted in 1967. The production is great and not as raw as the first CD but the instrumentation and the short psych-pop songs are amazing. This CD is going to be BIG!!!!!!!! The CD opens with the very 60’s track "Honeydripper". "Disconnected", the first single is next. "Pouring Water", probably my favourite song on the CD follows and is garage rock at its best! "Everythings Gonna Be Alright" is an incredible 60's vibe. If it has a more raw production you might think of it as a lost Rubbles single! Remember Arthur Lee? Guf does. I am amazed at how he so creatively creates that same 60’s vibe that LOVE had, now in 2003! "Carrie" is a very dark psychedelic ballad and the second single that will be released off the album. "Money For Soul" starts with a movie sample from somewhere and is a total party song from the acid 60's days. I love the distorted guitar on "Never Coming Back" and the 60's organ is brilliant. "You Own It" is a slow, more psychedelic number. "Volcano" is by far the heaviest song on the CD and reminds me of the early Monster Magnet material and is a great closer. If you want to go back in time, grab this CD and turn your self on.